Holy trippy Hell! Oscar Wilde takes us through the opium dens of Victorian London in The Picture of Dorian Gray, and one can't help thinking that perhaps an opium dream was the inspiration for the book. I have always thought of Oscar Wilde as a witty, upbeat, hilarious playwright who could skewer society with his words. I realize now that he was much more than that. This, his only, novel is a serious look at the nature of morality, the influences that play upon us and ultimately, how the way others perceive us and the way we perceive ourselves lead us down our life paths. 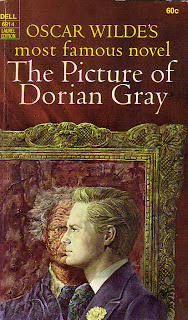 The Picture of Dorian Gray centers on a painting. Basil Hallward, an up-and-coming painter, does a portrait of his muse, Dorian Gray, and it is the greatest masterpiece the man has ever made. Hallward has put his soul into it, and the painting is an extension of him and his ideals. He wants always to think of Dorian as he is in that painting- pure, untainted, young and beautiful. But Dorian has met and fallen under the spell of Hallward's friend Lord Henry Wotton, who believes that life is not about morality or goodness, but about the pursuit of pleasure in all its forms. In a fit of temper, Dorian becomes jealous of his portrait, complaining that the portrait will always stay beautiful and young and perfect, while he ages and withers. He wishes that he could switch places with the portrait- that he can stay young and fresh forever, while the painting shows all the destructive forces of age and vice. He soon finds that his wish came true, and readers must watch and learn exactly what happens when a man is able to do whatever he wants, leading a truly Victorian double life, without the consequences of that lifestyle ever being visible upon his body. I didn't realize until I was in the middle of this novel just how Gothic it is in tone. Like many Gothic novels (Dr. Jekyll & Mr. Hyde, Frankenstein), it describes the conflict within one character to balance the true desire to be a gentleman against the baser instincts of depravity. This theme seems particularly fitting to describing the life of a Victorian man of leisure, who faced such stringent codes of conduct in society, and then often escaped those in brothels, drugs and other duplicitous activity. Beauty, too, is so important in this novel. Beauty trumps nearly everything else, with Dorian himself seeming like a Greek god who devotes himself to learning as much as he can about jewels, masterpieces of literature, music, tapestries and the like. And because he learns so much about these lovely topics, and because he himself is so witty and handsome, he is able to keep his societal standing even as he sinks lower and lower into depravity. There are many other themes that jump out of this novel, often described in great detail through Lord Henry. Some of these passages ran on a little too long for my liking, especially the dozen pages or so describing every single one of Dorian's reactions to a little yellow book that Lord Henry gives him, or the pages telling us in serious detail every single piece of beautiful art that Dorian devoted himself to. WE GET IT. What really kept my interest throughout this novel was Wilde's writing style. Not for him are the fainting ladies and distraught gentlemen that populate most Gothic fiction. No, at the center of his novel is a thoroughly self-absorbed man who has been corrupted by the influence of others and finds that he greatly enjoys life on the precipice. 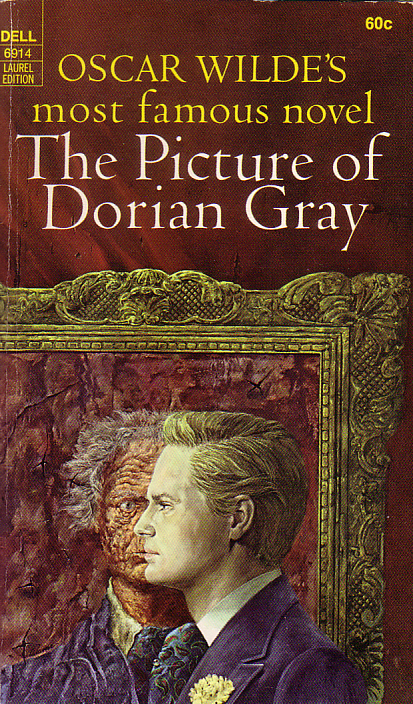 Dorian Gray is completely repulsive to me, but why? We don't actually get any of the juicy details on most of the things that he did. Deflowered virgins, I assume. Took a great many male lovers. Bankrupted some, blackmailed others. All despicable acts, but they are only hinted at in the story, none is described at all. Instead, we get vague mentions and the proof of a portrait becoming more and more hideous, and the company of a man who seems not to care or notice the destruction he wreaks. It's like the literary version of gaper's delay. You just can't help watching. While the characters in this book fascinated me, I can't say I liked them much. The cynicism and heavy boredom present throughout were just too much for me, and I couldn't help feeling that everyone in this story was just utterly spoiled and unable to find useful ways in which to occupy themselves. It was a great study in psychology, and a fascinating idea, but I am glad I don't have to spend any more time with these characters! Hmm, Dorian Gray is one of those books that I've always been curious about but never actually wanted to read. Now I know why. ;-) I have seen it performed as a play though. I have to agree with your description - fascinating but not very likeable. I've long wanted to read this book. I have a copy collecting dust. ;) I think the long passages might bore me, but I'm still curious about his writing style. Rachel - I wonder sometimes why Wilde didn't write this in play form, as he was such a strong playwright. Anna - Yes, I definitely skimmed some of the longer passages, but generally was engaged with the book. Reading your review I found myself wondering why Dorian's wish is granted so readily. Usually the 'be careful what you wish for' trope of instant wish granting works differently right? Often the people wishing are already terrible people and their wish destroys them, or they're ok people with flaws who need correction and the wish teaches them something (every body swap comedy ever). Or if they're reasonably good people, the wish may hurt them initially, but then leads them to great things because their inate goodness needs rewarding. Dorian is barely characterised before he gets his wish if I remember, so he's really not that terrible, nor that good (although Basil sees him as pure). Interesting that Wilde's wish granting isn't a way for him to show correct character behaviour, but more like an intellectual exercise where he takes one man to the ends of depravity, just to see what happens. Or do you think Dorian's rejection of Basil (he so knows what Basil feels about him and he turns towards something more attractive) is enough to make him a bad character Wilde can punish with wishes granted? I read it ages agao, but don't think everyone in this book was spoilt myself. Basil and eh I've forgotten her name, but the young actress Dorian ruins, were pretty employed, if in artistic endeavours. Jodie - No, you're right. Not EVERYONE was spoiled, but Dorian and his set definitely were. I think Dorian ruined Henry's sister, for example, but Henry kept up his friendship with Dorian because Dorian wasn't boring. Or something like that. As to your question, it's a good one. I think Dorian was unformed when he granted his wish. He didn't realize how beautiful he was, or how his personality drew other people towards him. It was only after this was made clear to him by Henry that he made his wish, and as he became more and more cognizant of his power, he went deeper down that drain. I personally think it's much more about how open Dorian was to influence and suggestion than about his innate morality. Or perhaps Wilde means to say that EVERYONE has a dark side, and when you lose the battle to fight it, it can overtake you. I read this book in the beginning of the year, and was really intrigued by Wilde's ability to craft his story and his ability to use language to the fullest. I do agree that most of the characters in this story were selfish and in some ways, very neurotic. I got a lot out of this book, but I do have to agree with you that I was glad when it finally ended. This book made a really strong impression on me, and I knew that after reading it, I wanted to read more of Wilde's work. This was an exceedingly wonderful review, my friend. I really think you got to the crux of what made this book tick. This is actually the first real thing I read by Oscar Wilde (I think I read some of his fairy tales as a kid), so for me it was really a pleasant surprise to discover he was actually witty and fun, and not always dark and dreary! My husband loathed this book. He read it a few years ago and still talks about how awful it was. So that may be why I have been hesitant to pick it up, although my husband also hated Farenheit 451, which I thought was fantastic, so maybe his opinion isn't worth much! Aarti, I agree with you about not liking any of the characters - which is probably why I'm somewhat ambivalent about this book - I think it's one of those must-read books, but it's not one I'd rush to read again (which probably doesn't make complete sense). Interestingly, for about a decade, this was the only Wilde work I'd ever read. When I finally got to his plays last year, I was really surprised by the way they were written. This is one of those books I could read over and over, and have, at least three times now. Yayyyy! I'm sure I don't need to tell you how much it warms my heart to see people liking Oscar Wilde. I do love him so. (Though as much as I love him, I do sometimes skim over the long purpley passages in Dorian Gray.) I think this would have been tricky to do as a play, because it all goes by implication and insinuation -- that whole idea that the reader brings his/her own crimes to the book and projects them onto Dorian -- and you would lose a lot of that if you made it into a film. I think much of the pleasure of this book is in the devilish things people say in it-the 1945 movie version of the book does a really good job capturing the feel of the book-the lead characters are all quite unlikable-I enjoyed reading your very interesting post. "Holy trippy Hell" was exactly my reaction when I started reading this book. It was just so hard to put down and I loved how Wilde took liberties with his characters and made them really stand out! I loved it! But I'm sure, had it been any longer, I wouldn't have. Some books are perfect in shorter form. I've only read his humorous plays and have been meaning to get to this one for ages. There are so many references to this in other books and in films, I feel that I have to make time for it! I think I have a copy of this book. Time to go look it up. this has been sitting on my shelf for a while. I just haven't found the right mood to read it. I should reread this, I do love Oscar Wilde. As you point out and Jenny mentions, the vagueness of what Dorian does to pickle himself in dissolution is an important part of how this book works on the imagination. The images used in the movie are just silly. My teenagers refer to the movie as "Dorian Gray...getting some tail." Although speaking of beauty, watching the movie is not a total loss, because Ben Barnes is truly beautiful. He makes me think of Iago's line about Cassio: "he hath a daily beauty in his life..."
I enjoy a good psychological read and this one has been on my list forever! I'm fascinated by the character but disappointed that Wilde doesn't give more details about his downfall.